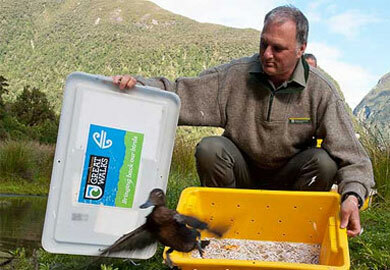 Air New Zealand is a national partner with DOC for conservation. Both acknowledge that our environment underpins our country’s cultural, social and economic prosperity and wellbeing. Air New Zealand invests in large biodiversity projects alongside the Great Walks network – enabling over 23,000 ha of sustained pest control and the return of native birdsong to these special places. Current biodiversity project areas include the Whanganui Journey, Abel Tasman Coast Track, Heaphy Track, Routeburn Track and Milford Track. Air New Zealand also works together with DOC to promote the Great Walks – encouraging New Zealanders and international visitors to experience these iconic journeys. Since the partnership began in April 2012, overnight visitors on the Great Walks have increased by 50%. With 80% of New Zealand’s indigenous biodiversity estimated to be underwater in the marine environment, it’s crucial that we learn more to care for these precious habitats. As kiwis, we are lucky to be surrounded by endless coastline, and we all want healthy oceans that we can swim in, gather kaimoana from and be proud of. The partnership with Air New Zealand enables a number of collaborative marine science projects, including DOC’s Ecological Integrity and Sentinel Site programmes. Air New Zealand transports some of New Zealand’s most endangered species (birds, reptiles and invertebrates) and Conservation Dogs as part of active recovery programmes. Species are transported for genetic and population management, to treat illness and to establish new populations at safe breeding sites. Air New Zealand has provided free flights for more than 2500 species and Conservation Dogs since the partnership began in 2012. Air New Zealand also supports DOC’s Threatened Species Ambassador, Nicola Toki, to help raise awareness for our threatened native plants and animals. With this support, Nicola is able to inspire New Zealanders about nature and the plight of our threatened species. 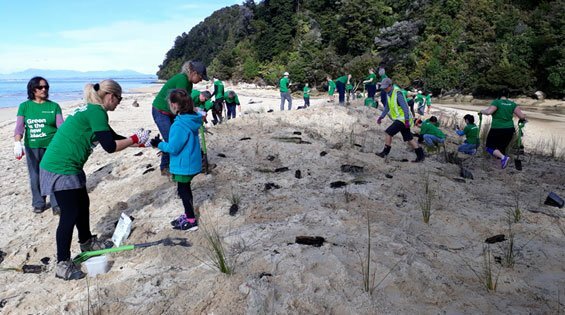 The Greenteam is made up of approximately 2500 Air New Zealand staff who together with their families, volunteer on community conservation projects around New Zealand every month. Air New Zealand and DOC have further strengthened their partnership and commitment to New Zealand’s biodiversity with the funding of a four year, $400,000 project on the Paparoa Track, the site of the newest Great Walk. Air New Zealand, DOC and local iwi have today announced new conservation initiatives on three of the country’s Great Walks. The new joint initiative builds on the existing work with DOC, and will support bird populations in the Abel Tasman area.